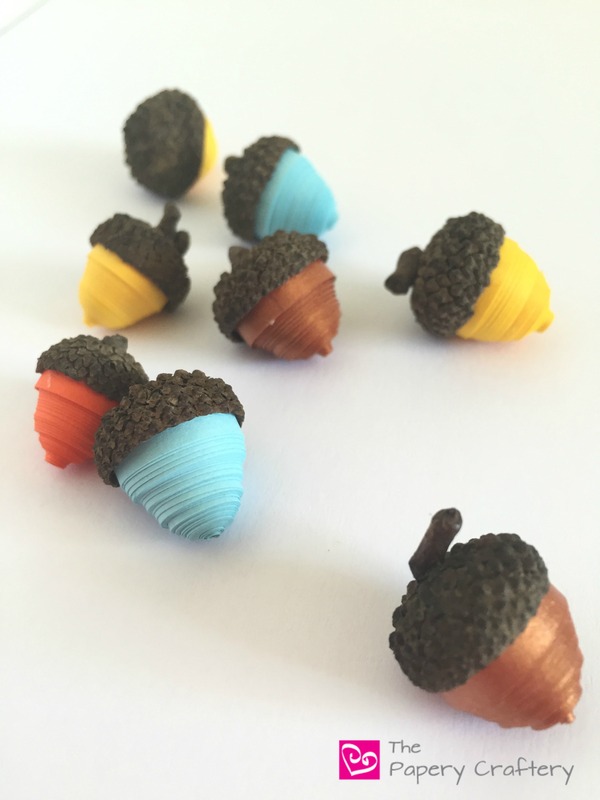 Quilling paper acorns, although totally and completely adorable, aren’t really a new design. There are a bunch of quilling paper artists designing and selling paper acorn ornaments that are just lovely! But when I was brainstorming new autumn quilling crafts, it dawned on me…. I could make a quilling paper acorn with real acorn caps! It’s the perfect way to add a natural element and a little texture to your quilling and (at least for quillers like me, living on the East Coast in a house under a big oak tree), free and available by the dozen right outside my door! First thing’s first: collect acorn caps. If the natural acorn caps are not right there in your backyard like at my house, I did find tons of shops selling them on Etsy. The ones with the stems are my favorites! While the caps are drying out, start rolling your acorns! Small caps will need about 36″ of paper in a tight coil. Larger might need up to 48″ or more! You will probably need to glue multiple strips end to end to get a large enough coil to fit snugly in the acorn caps. TIP! : When coils get to be on the larger side, take the coil off of your quilling tool and roll by hand. It will be a lot more manageable. Using your finger, gently push our from the center of the coil to create a dome. You might find that a pencil eraser or some other sort of instrument can be useful to push your paper acorn around too. UPDATE: I’ve recently purchased a quilling mold and it would be super-helpful for these acorns! This technique is the basis of 3-dimensional quilling designs and can be used for all types of projects, like these daffodils and flower buds! For a totally authentic looking acorn, try pushing the very center of your dome out a little further with a quilling tool, or some other thin object. To keep your acorn dome looking dome-y, apply glue all over the underside, and spread with a brush. Once the glue is dry, the acorn will keep its shape! Squeeze a thin line of glue all around the edge of your paper dome and attach an acorn cap. I was totally influenced by the painted blue acorns that Beth from Home Stories A to Z has created. And the shiny copper acorns are seriously my jam! I could just sit and roll these quilling paper acorns all day long! Fill up a bowl for simple autumn decor or spread them along your Thanksgiving table centerpiece! Update: Check out my DIY Paper Acorn Garland for some inspiration! What colors are you going to use to for your quilling paper acorns? Leave a comment below and inspire us! Very cute! Would make a great addition to a centerpiece, garland or scattered on an autumn-themed dinner table. Visiting from Bloggertunities FB. Thanks Victoria! I was thinking that I might sprinkle them around my dining room table centerpiece too! These could be easily integrated into beautiful vignettes for fall, thanks for sharing! So glad you think so, Diana! I have so many ideas what I can do with the acorns I’ve made so far! Wow these are very cute and I love that you used real acorn caps to create them. Natural elements are honestly my favorite 🙂 Thank you for sharing. Thanks so much! They don’t take long to make either! Thank you for taking a peek, Christa! It’s my favorite season! That’s really cool! I am not creative at all, so I really had no clue how to make them. But they look great and look really fun to make! Thanks Mary Ann! I’m sure you could handle this craft! These are great and so fun to make. I would love to make these. Thanks Vanessa! And there are so many ways that I can think of to use these in my fall decor. I hope you give them a go! I’d like to try this – of course I have to buy the paper!! What paper width? Great question! Standard quilling paper is 1/8″ in width, but you could also find 1/16″ and 1/4″, as well. I wouldn’t think the width would make too much of a difference, as the size of the quilling really depends on the size of the acorn cap, itself. Thanks for answering! Have to look for special acorns/caps this weekend!! So cute! Thank you for sharing with us at the To Grandma’s house we go link party – pinned – you hope to see you tomorrow when the next party starts you’ve been featured! So beautiful! I think I would make mine traditional brown, tan, orange, gold, bronze and through in a blue few! thanks for the tutorial. I can’t wait to start quilling! Yay! I’m so glad you’re inspired to make these! Let me know how they turn out!